‘Staying cool’ around the resort when the sunshine is bright — is a vital skill or perhaps, even an art. Many ‘Tween Waters Inn guests on Captiva Island visiting Southwest Florida have ‘sunshine’ at the top of their list for ‘why’ they travel here to spend their spare time. With so many things to do outdoors my husband, Eric and I know first-hand how easy it is to get too much sun, too fast and find ourselves looking for places and things to do while we cool down a little bit. Walk through the lush vegetation areas to get around the resort and stay cool under shady trees and roof lines. Visit the pool early morning or late afternoon when temps are the coolest all day and it’s the perfect time to start a tan. Pack and wear your stylish hats, or pick up a new ones in the Pelican’s Roost Boutique near the dock entrance of the Marina. Umbrella spots beside the pool are more likely to be open when the pool deck is less busy and the sun is lower in the sky. Morning is the time to reserve a shady chaise on the beach and to simply take it easy hanging out beside the sand and surf. Wear shorts, skirts, light fabrics, t-shirts and sandals anytime, anywhere and dress up only if it suits your beachwear fancy. 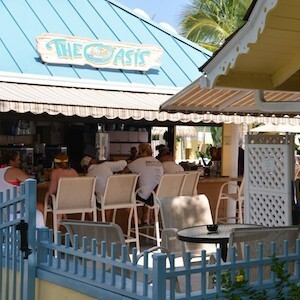 Remember that the Oasis Pool Bar offers a shady spot all day where you can chill, sip cold drinks, make friends and sit beside the pool. It’s also the place to enjoy lunch or order it ‘to go’ and take lunch back to your air-conditioned room, suite or cottage you call home. Early afternoon is a favorite time to relax on your private lanai where the temps are cooler when the sun is high in the sky. Schedule favorite Spa appointments dedicated to your complete comfort and relaxation after you’ve been outside in the morning. Afternoons are traditionally the tropical time for a brief siesta or nap when the temps are always the hottest outdoors all day. Later in the day take your time exploring the quiet back bay waters paddling a rented canoe or kayak through the mangroves. Make a reservation at the Captiva House restaurant first thing and look forward all day to a memorable dinner right around sunset. After dinner share a night cap or even an impromptu fiesta at the Crow’s Nest Beach Bar & Grille next door where having fun is popular. Make it a habit in the evening to take a stroll down to the beach before bed when it’s cool, breezy and the sand is lit by the moon. At ‘Tween Waters Inn when you get over heated you have the Gulf of Mexico waters and the resort pool to cool down in anytime. Then you can take it easy while you make a decision about what to do next. Most importantly, stay cool and enjoy!